Girl: “So, with a certain romantic day coming up soon, I was thinking it would be the perfect time to go to that place I mentioned.” Guy: “What the hell are you talking about?” You know how this sad, familiar scene ends. What you might not know is how Lovendar can easily help couples communicate and remember to do the things that make each other happy. Lovendar is an iOS relationship app for two, a private network for sharing wishes that couples put into action to show their attention and love. Partners create “buckets” to fill with gift suggestions, date ideas, reminders, and more for a significant other to keep at his or her fingertips. Lovendar combines features of other popular apps such as Pinterest, Evernote, and Clear, to help couples focus energy into enhancing their relationship. Photo-centric like Pinterest, the Lovendar relationship app organizes items visually into respective categories, but intended to be shared privately between two people. A two-finger tap quickly launches the camera, so no matter where you are in the app, it’s easy to capture inspiration. Within a bucket, items may be prioritized, as well as have notes, calendar dates, or locations added to them. This ensures that great ideas are never lost out in the bustling world or within a complicated network of posts and texts. There’s no limit to the number of buckets couples can create, so it’s easy to store everything from movie preferences, favorite recipes, weekend ideas, clothing sizes, and other important details that frequently elude us when we need them the most. Each bucket also serves as an actionable todo list. In addition to ordering priorities, a simple swipe gestures allow items to be marked as completed. What’s more, partners may send alerts to one another, or add hidden notes-to-self to prevent spoiling a surprise. Stumbling in the romantic dark is supposed to be hot, not hopeless. Lovendar removes the guesswork from trying to find meaningful gifts or planning enjoyable outings that will build a stronger relationship. Yes, it’s about making it easier to do the small things that keep couples happy, but it’s also a tool for communicating desires clearly and improving collaboration. For those intimidated by the demands of commitment, signing up for Lovendar is like taking a huge baby step. No oaths, no declarations – but doing so expresses a willingness to learn what makes the other tick and to put effort into creating special moments together. As an added delight, Lovendar becomes a digital scrapbook or collage, recording the relationship’s joyful progression. Founder Ellona Ferson adds, “Couples want to spend quality time together. That is one of the most important elements of a happy relationship. They just need to know what the other person wants to do and remember to do it. 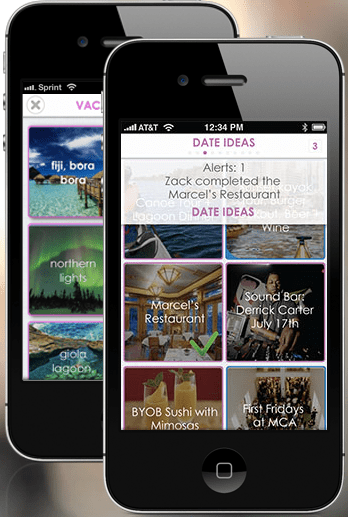 Lovendar app helps you capture and share ideas, as they come. We all need a little relationship assistance from time to time. Some of us a lot. Valentine’s Day is February 14th. About that restaurant she wants you to take her to… yeah, Lovendar would have reminded you to make the reservation a few months ago. Time to consult the “I screwed up, but I’ve arranged for us to do something you’ve always wanted to” bucket.